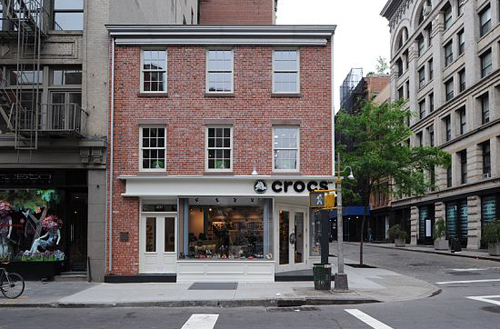 When shoe retailer Crocs set its sights on Soho, the blogosphere didn’t hesitate grouching about the rubber clog emporium’s arrival at the corner of Spring and Wooster streets. What was feared as an assault of global branding, however, has become an unlikely symbol of a sea change for New York City’s Landmarks Preservation Commission, which pushed for a modern, glassy volume in the heart of the historic cast-iron district. 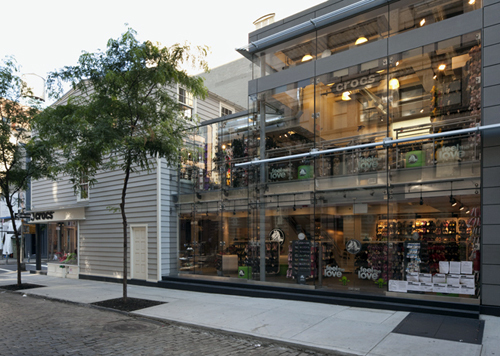 The project began in 2006, when Crocs signed a 20-year lease for 4,800 square feet for its New York flagship. At that time, the three-story corner house was in bad shape. Built in 1818 as a single-family residence, it had undergone six renovations and most recently housed a Tennessee Mountain restaurant. 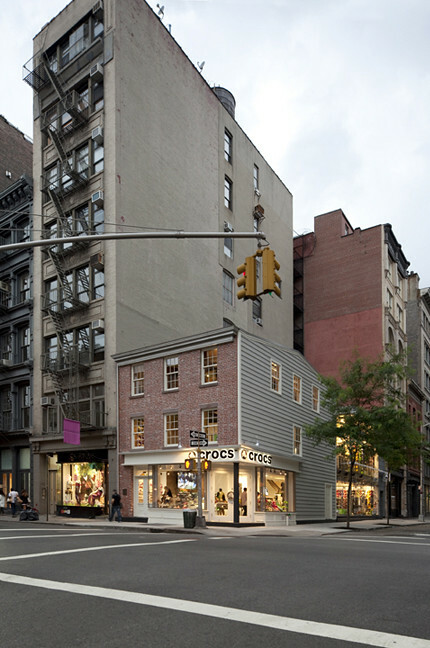 Because of its age and location, any alterations of the Federal-era building needed LPC approval, and thus began a year-long saga with five public hearings that resulted in the unusually contemporary structure in the center of Soho. The first order of business was to shore up the historic house. Working with ELAN General Contracting, the team re-bricked the south face of the old corner building, salvaging some of the original brick, and replaced dilapidated brownstone lintels and sills with cast stone that resembled the originals. The adjacent facade was covered in new cedar shingles over a wood frame, a typical Federal 1920s design. Replacement wooden clapboards were used on the west and north facades, new multi-pane windows inserted, and the original gambrel roof lifted to its present configuration. A wood-and-glass storefront flanking a chamfered entrance was also kept, having been the house’s first transformation. Its original columns were saved, but stainless steel replaced the storefront’s wooden frame as a more modern and durable alternative. 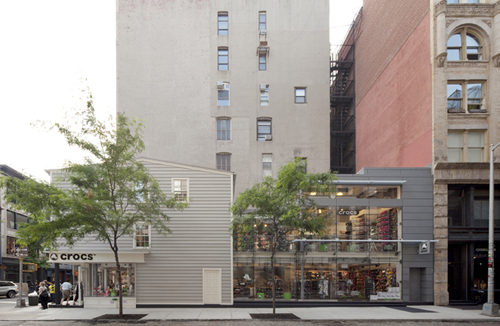 The Wooster Street addition is a much bolder story. Here, a structural system in finned glass and zinc-coated panels was designed to reveal most of the original house’s features. The flat roof was pushed back, while panels of 18-inch-deep structural glass and metal spring plates hold up the walls. At the north wall, the glass was put into a metal channel inserted from floor to ceiling in the old building. The palette of zinc and coated copper was picked to correspond with the weathered steel in the area. With taller buildings nearby, the new glass structure could theoretically have been made six stories high. This, however, wasn’t something either LPC or Crocs desired. From Crocs’ point of view, additional floor plates were not seen as viable for commercial or residential use, given a plate area of only 1,000 square feet. LPC, on the other hand, did not want the old structure to be obscured. “In New York, you always want to maximize square footage, but because of the old building, it is very hard to make use of that area,” said Rockwell. Inside the store, which opened in May, a ceiling height of almost 30 feet creates a spacious feeling. An elevated mezzanine surrounds the space, a remnant from the 1970s, when the building was a sushi restaurant. 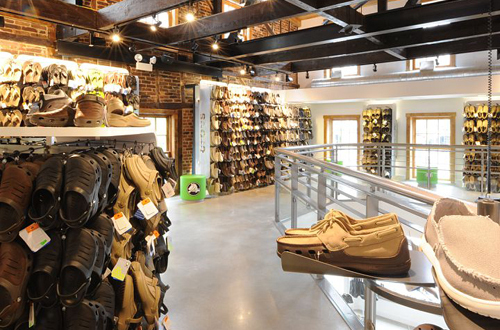 Salvaged hand-hewn trusses and an exposed brick wall contrast with the modern retail interior, designed by the Crocs team with architect Donald W. Laukka of L&M Associates, who helped plan interior improvements and mechanical systems.